Tile flooring is stunning and preferred in many bathrooms and kitchens, but most people will agree it feels cold on their feet. Mike Green of Maxxon SE knows this well. 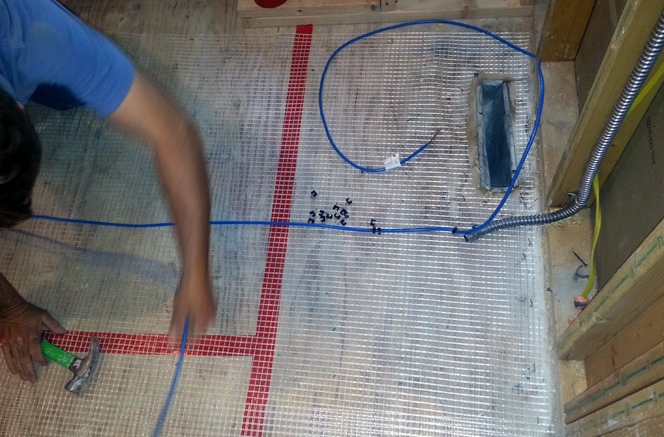 He’s been working with radiant heating for 26 years and has installed several hundred systems. 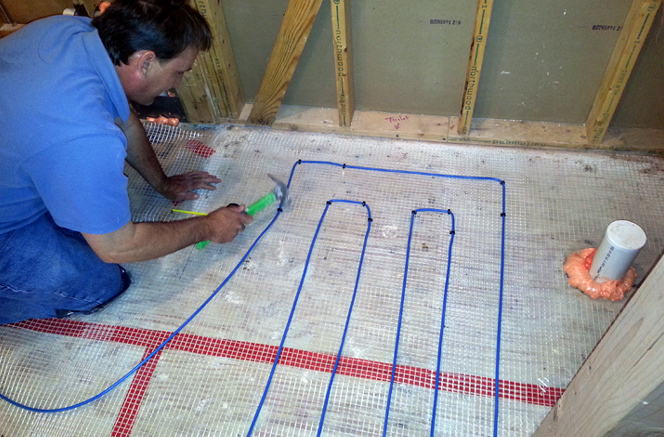 He recently completed a bathroom installation with Infloor Heating Systems heavy-duty electric cable in a residential home in Charlotte, NC. The reason is simple. “The homeowners wanted the comfort of a warm floor,” he said. 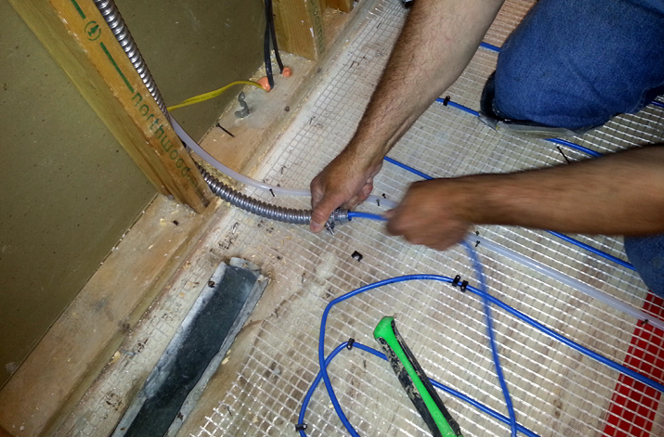 Bathrooms make up roughly 95% of the electric cable installations they do, Mike said. The 64 square foot bathroom measures out to 8’x8’ with a bath tub. He recommends the heavy-duty electric cable for bathrooms because it is durable, long-lasting, reliable, and has no moving parts. The cable was installed over plywood, 5” on center, and fastened down by clips. They will then pour ¾” gypcrete over that before the final floor covering of tile is put in, which is installed by a flooring expert. 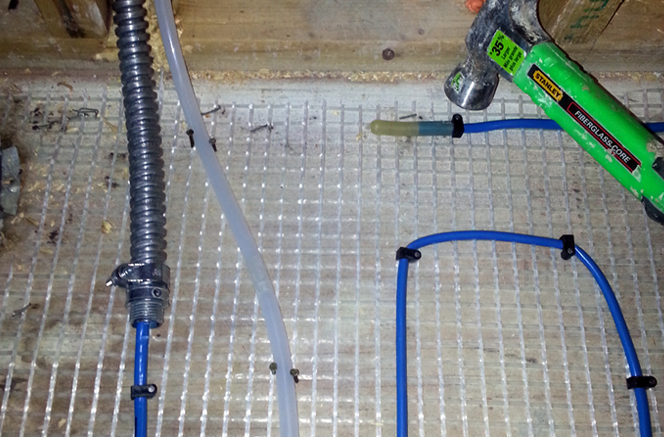 “Infloor Heating Systems electric cable is easy to install with a very fast layout,” Mike shared. “We can complete the installation in a few hours. It is also a self-terminating cable, so we don’t have to run it back to the electric box,” he said. The cable ends at the far side of the room, closed off with an end cap. It fits well in rooms of various shapes and sizes, making it a great choice for a variety of bathrooms and other rooms. 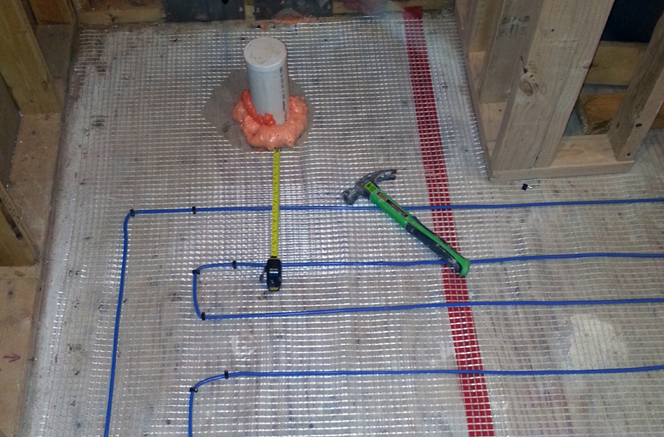 The electric cable radiant heating system is controlled by a simple thermostat. Once it is turned on and the desired temperature is set, there’s nothing more to maintain. The cable pulls a few hundred watts of electricity to reach the set temperature and then shuts off automatically. In between those times, it coasts, until heat is called for again, Mike explained. “It’s so simple, that’s the beauty of it. The only thing that could wear out is the thermostat, making it very easy to maintain and trouble shoot,” he said. 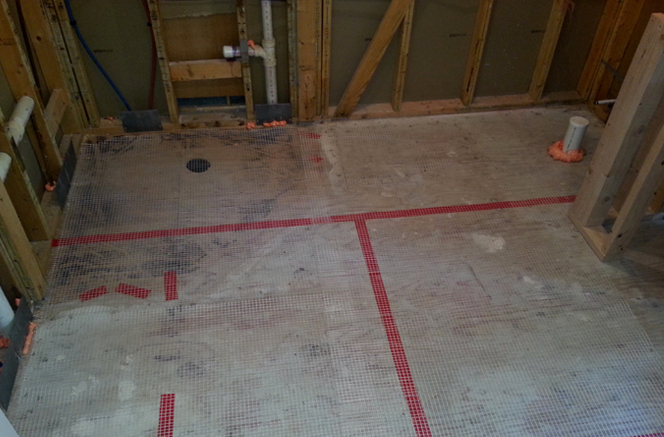 The bathroom is located over a crawl space, making good insulation important. “I work with contractors to make sure there is proper insulation installed underneath the floor,” he said. The heat generated in the bathroom will not be wasted. It produces thousands of BTUs that go beyond the room and into the house. 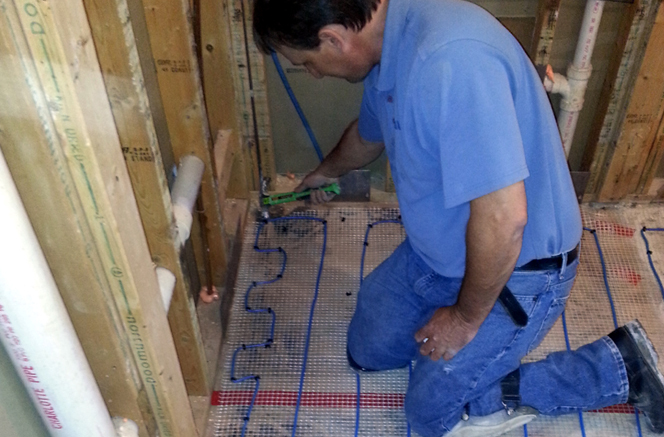 Maxxon SE is a trusted distributor of Infloor Heating Systems, specializing in floor underlayment, leveling, and hydronic and electric radiant heating. Maxxon SE has earned a reputation as a full-service resource, providing the information you need to make sound decisions as well as a spectrum of underlayment products that meet your specific project challenges. 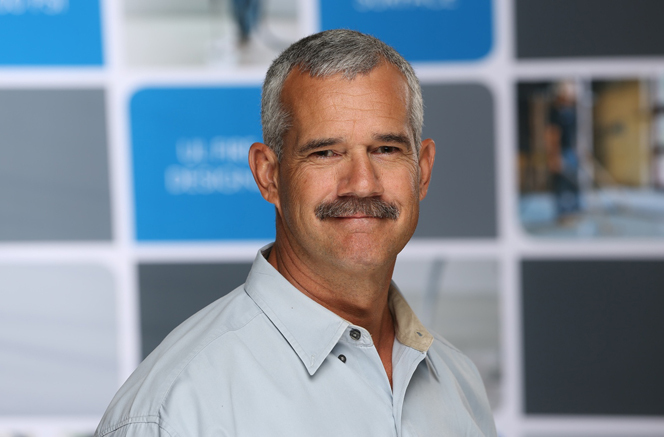 Since 1984 when Mike joined Maxxon, he has encountered nearly every floor challenge imaginable, making him an excellent resource. Mike knows how to identify potential pitfalls and what to specify to make sure every job goes smoothly and achieves the intended end-result. During the installation Mike is on hand to make sure the application runs smoothly and quickly, whether his help is needed breaking bags of underlayment or putting the finishing touches on a freshly poured floor. When not working, Mike enjoys spending time with his family and fishing. Learn more about Maxxon SE at www.maxxonse.com and contact Mike Green for assistance in the southeast region of the United States at mike@maxxonse.com.